Destroyit deskside model business shredders put effective data security right at your side. Specifically designed for office use, these machines are more powerful and durable than ones from office superstores. 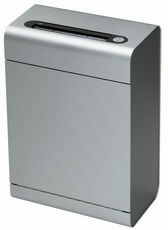 A wide model range and variety of shred sizes allows you to choose the perfect shredder for your specific needs. All Deskside models have quiet motors, high sheet capacities, and a variety of electronic features for easy and safe operation. All Deskside strip- and cross-cut models will accept staples and paper clips and several will shred CDs.